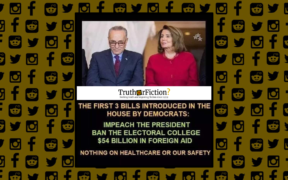 nancy pelosi Archives - Truth or Fiction? 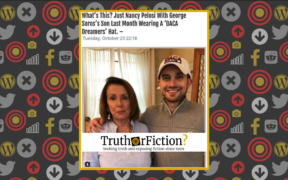 Is This a Photo of Nancy Pelosi and George Soros’s Son? 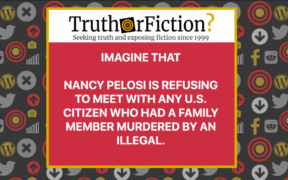 Is Nancy Pelosi Refusing to Meet with Any U.S. Citizen Who Had a Family Member Murdered by ‘an Illegal’? Nancy Pelosi: Building A Border Wall Violates the Rights of Illegals-Fiction! 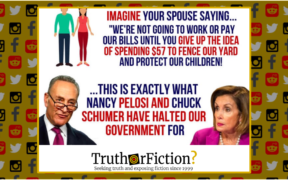 A meme falsely claiming that Nancy Pelosi said "Building a wall will violate the rights of millions of illegals" has been circulating since January 2018. Nancy Pelosi Scolds Lawmaker for Standing for Trump at State of the Union-Fiction! False claims that Nancy Pelosi scolding a lawmaker for standing for President Trump at the State of the Union Address are based on photos that were taken out of context. Nancy Pelosi Disgusted With Trump for Letting People Keep More Money They Earned-Fiction! Nancy Pelosi in Fatal Car Accident, Tests Positive for Cocaine-Fiction! A self-described "satirical" website is behind false reports that Nancy Pelosi was involved in a fatal car accident and later tested positive for cocaine. Nancy Pelosi's Daughters Arrested for Selling Cocaine-Fiction! A website that publishes "works of satirical fiction" is behind false reports that Nancy Pelosi's daughters were arrested for smuggling cocaine.